Comics have been a rage since humans have begun drawing. While a good book contains an elaborate story, a comic can show what the words have to explain. After all, picture is worth a thousand words. 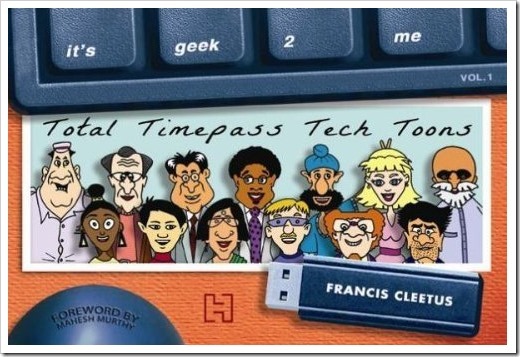 ‘It’s Geek 2 Me’ is written by ‘Francis Cleetus’ and is a collection of comic strips. Most of the strips are 3 or 4 column long. The base is technology and the background is of an office. ‘It’s Geek 2 Me’ is like a sitcom with a collection of major and minor characters with each comic strip follows an individual storyline while increasing the connections among them. The author has setup the relationship dynamics and a background in the beginning itself by giving character introductions. This means, as a reader, one can directly jump to any comic strip without worrying about any story breakup. The comic strip shows a fictional company- Paradox Software Corp. where there are several employees who interact with each other in technology lingo (hence the geekness). Even the names of the characters have been morphed slightly to resemble technological terms like System Analyst Loginder Singh or CEO Spam Murphy. First, the good – They are witty and creatively crafted and will make you tickle for the most part. The innuendos are rightly placed. Also, due to a large repertoire of characters, the flexibility for creating different scenarios is great which the author has used to his advantage. The interpersonal relations among the characters have been used quite well to bring out home and office humor as well. The takes on Murphy’s Law are particularly hilarious. On the other hand, the comics are referencing a particular field creating boundaries – Technology, Office and India. This means that the jokes become a little inside ones if you do not pertain to any of the three. Although, due to the large number of young engineers in India this might not be much of an issue audience-wise, the jokes might fall flat if you do not have inclination for technology or understand of how things operate in Information Tech offices in India. Also, some of the strips seemed old age jokes rehashed with technology. While there is nothing wrong with it, one might find them a little boring at times. In the end, if you are interested in technology and love geek jokes, this would definitely add to your hilarious quotient. For such people I would give this book a rating of 3.5-4 of 5. Francis Cleetus has created some good content that will keep you laughing for the most part. For people who are not interested in technology should give it a pass. The jokes in all probability will not tickle your funny bone. Weekly Wrap-Up: Moto X On Flipkart, Google CCI Fine, Quikr $90M Funding More..